Food collections at Temple Sinai in Brookline (above) are donated to the Grow Clinic for Children at Boston Medical Center. As part of the Torah reading on Yom Kippur afternoon, says Rabbi Andrew Vogel of Brookline’s Temple Sinai, Reform Jewish synagogues turn to Leviticus, Chapter 19, verses 9 and 10: And when ye reap the harvest of your land, thou shalt not wholly reap the corners of thy field, neither shalt thou gather the gleanings of thy harvest . . . thou shalt leave them for the poor and stranger. “We take that mitzvah very seriously,” says the rabbi. Many congregations around the country also take that mitzvah (a commandment or obligation) seriously and hold food drives during the 10 days of the Jewish High Holy days, which begin on Sept. 13 at sundown, and go through Yom Kippur, the Day of Atonement. Congregants might be asked to bring specific items, such as tuna or beans, or canned goods that are later distributed to food banks, pantries, and shelters. This tradition of sharing food with the less fortunate comes from the earliest teachings of Judaism, says Vogel, who explains that in another part of the Hebrew Bible, the prophet Isaiah (Chapter 58) instructs Jews to share bread with the hungry and take in the homeless poor. “Isaiah is saying, don’t come to the synagogue and fast on the holiest day of the year and neglect the people who are hungry 365 days of the year,” says Vogel. On Rosh Hashanah, congregants are given a brown bag to fill and return on Yom Kippur. Members Debbie and Michael Pullen coordinate the drive, which benefits Boston Medical Center’s Preventive Food Pantry and MetroWest Harvest, a Framingham food rescue program. Debbie Pullen creates a display in the temple lobby of needed items, along with empty bags and lists for congregants. “It’s a good visual reminder,” says the Sudbury resident. Food is loaded into a shipping container in the temple parking lot and sorted by volunteers and some of the Hebrew school’s sixth graders. “We get around 800 to 1,000 pounds of food from Temple Shir Tikva,” says Jeen Kniveton, director of MetroWest Harvest, “and they break it down into categories, which is a big help.” The program distributes to area shelters and pantries. “Feeding the hungry is a fairly universal religious value,” says Dr. Deborah Frank, founder and director of the Grow Clinic for Children at Boston Medical Center. Frank is a member of Temple Sinai, whose collections are donated to the clinic. “Forty percent of families bringing young children to the [ER] report that they’re food insecure,” says Frank, who has been working with malnourished children for 30 years. Collections should not be based on what donors happen to have, says the doctor. “Donate food that you would feed your children or mother.” Best are high-nutrient items such as baby formula, shelf-stable milk, dried beans, peanut butter, tuna, healthy cooking oils, rice, fortified pastas, and non-sugary cereals. While sporadic drives are common at most places of worship, during the holidays a whole congregation is involved. At Temple Israel of Natick, staples are donated to the pantry, A Place to Turn. (During the year, perishables regularly go to MetroWest Harvest.) Temple Emanuel of the Merrimack Valley in Lowell, where Dr. Frank’s husband, Neil Kominsky, was a rabbi, collects food for the Merrimack Valley Food Bank and its mobile pantry. Both Temple Beth Shalom of Peabody and Temple Sinai of Marblehead collect for Family Table, a kosher pantry run by Waltham-based Jewish Family & Children’s Service (a smaller pantry is housed at the Marblehead temple). “Our collection assignment this year is whole-grain crackers and cans of tomato products,” says Temple Sinai executive director Susan Weiner. 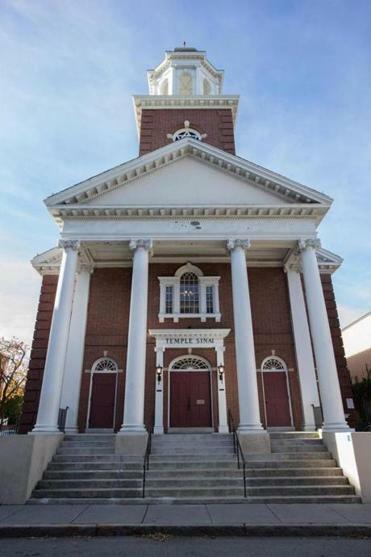 Temple Isaiah of Lexington also gets sporadic requests from Family Table; the majority of its collections go to the Greater Boston Food Bank. Of the 400 households currently using Family Table, program manager Bernice Behar estimates that 75 percent are Jewish and 35 percent of all clients keep kosher. “We love getting kosher canned salmon, vegetarian kosher soups, and no-sugar-added canned fruits,” says Behar. The pantry has experienced a 15 percent increase in demand over the past year. About a dozen years ago, the holiday drive at Temple Beth Elohim of Wellesley switched its focus from collecting food to creating a pool of funds, says Associate Rabbi Rachel Saphire. “It’s a way for folks to give generously and divide the collection among many organizations,” she says, including Family Table, Community Servings of Boston, the interfaith Family Promise Metrowest, Yad Chessed of Brookline, the national Mazon organization, and Leket Israel, Israel’s National Food Bank. “It’s never OK to not have enough to eat,” says Dr. Frank of BMC. Anyone fasting on Yom Kippur knows how difficult it is to go one day without food. “Try to go to school and learn algebra like that,” she says. Lisa Zwirn can be reached at lisa@lisazwirn.com.